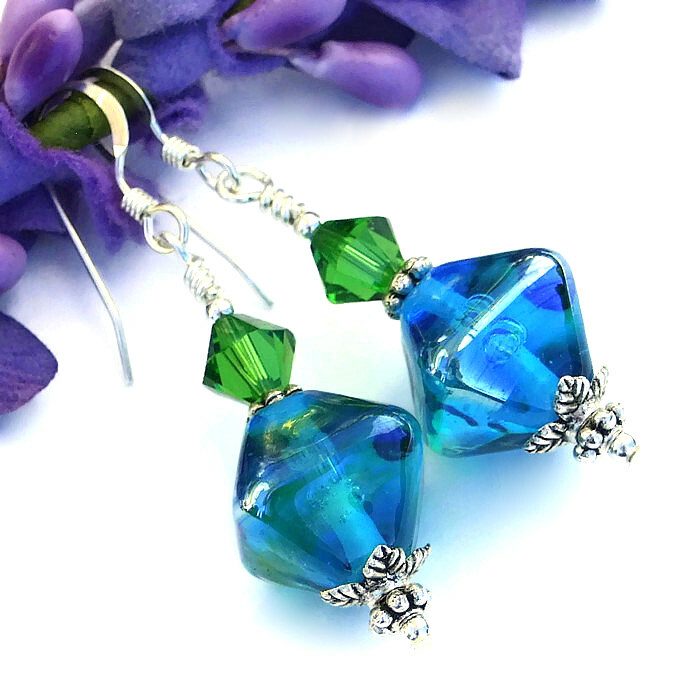 The rich, glowing color of the ENCHANTED AQUA handmade lampwork earrings almost takes your breath away in its dreamlike beauty. 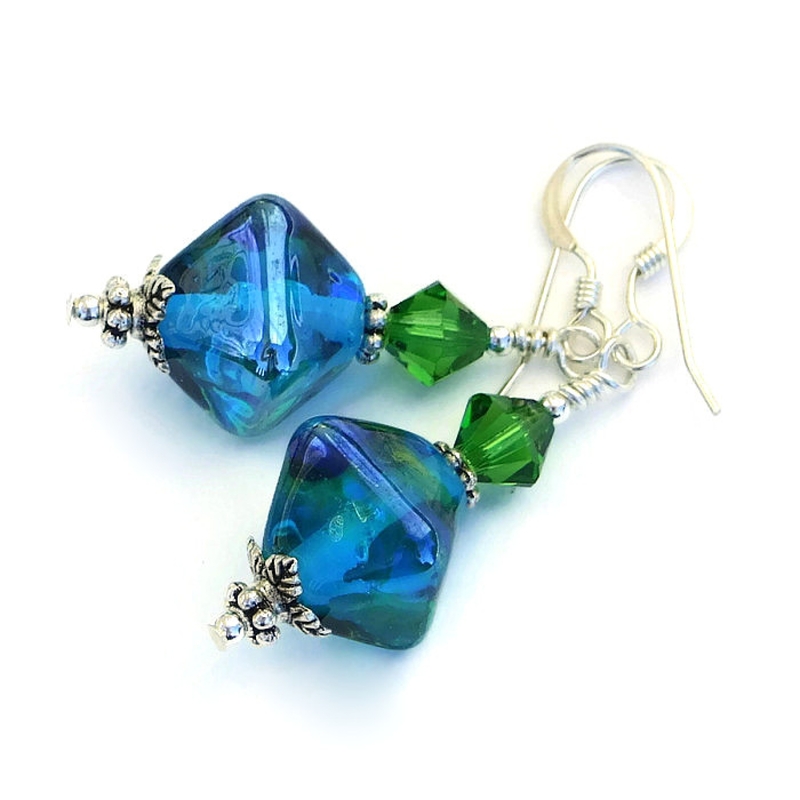 The four sided, diamond shaped lampwork beads used to create the unique earrings were individually handmade by glass artist Charlotte of Covergirlbeads. Because of their handmade nature the lampwork beads are very similar but not exactly the same. They were created with transparent aquamarine glass, wider in the middle than at the ends, and have a slight touch of a metallic helix aurae finish for added shine. If you look into the glass, bits of green show up as well as light refracting air bubbles, all adding great allure to the design. The bottom of each lampwork bead is encased with a lead free pewter bead cap with a very detailed four leaf design. Sterling silver daisy spacers and small beads were also added, while a single daisy spacer was added to the top of of each diamond shaped bead. 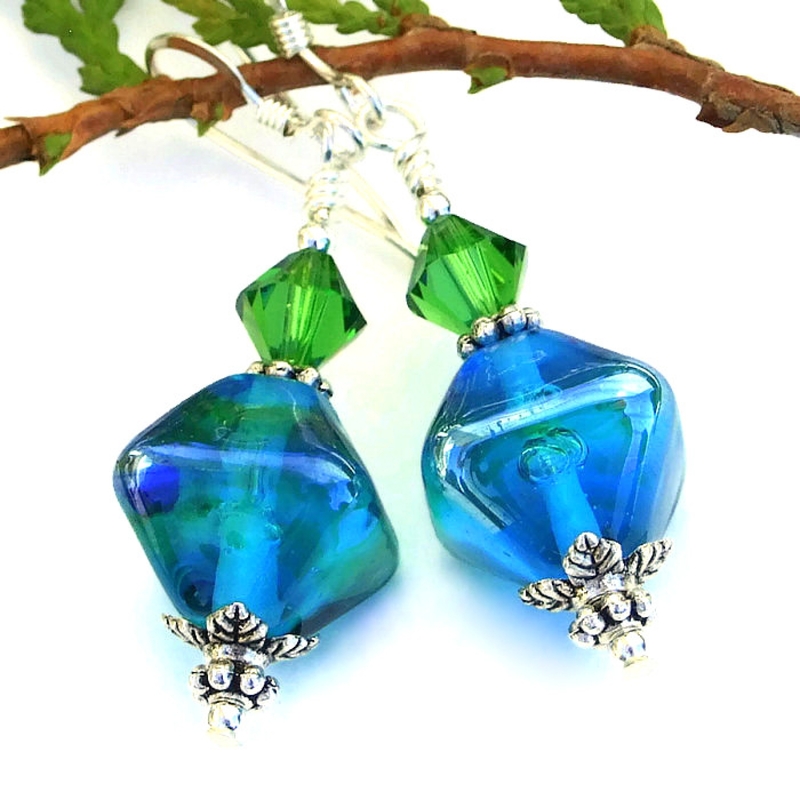 To add more than a bit of sparkle to the artisan dangle earrings and to bring out the bits of green in the beads, Swarovski crystals in a luscious “fern” green color was added to the top. Founded in 1892, the Swarovski company has manufactured crystals that are considered the standard by which all other man made crystals are judged because of their exact facets and impeccable polish. 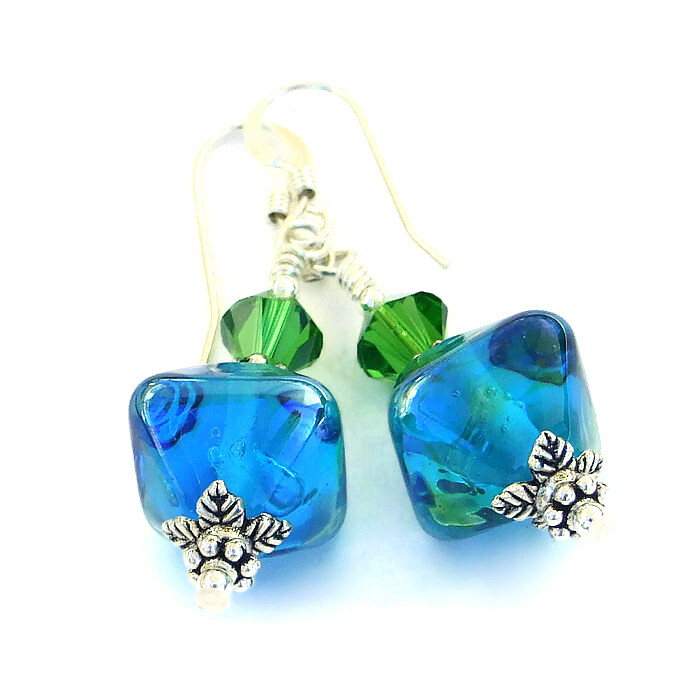 Their sparkle and flash is astounding, as you will see when you wear these earrings! Sterling silver French hook earwires finish the beauties. 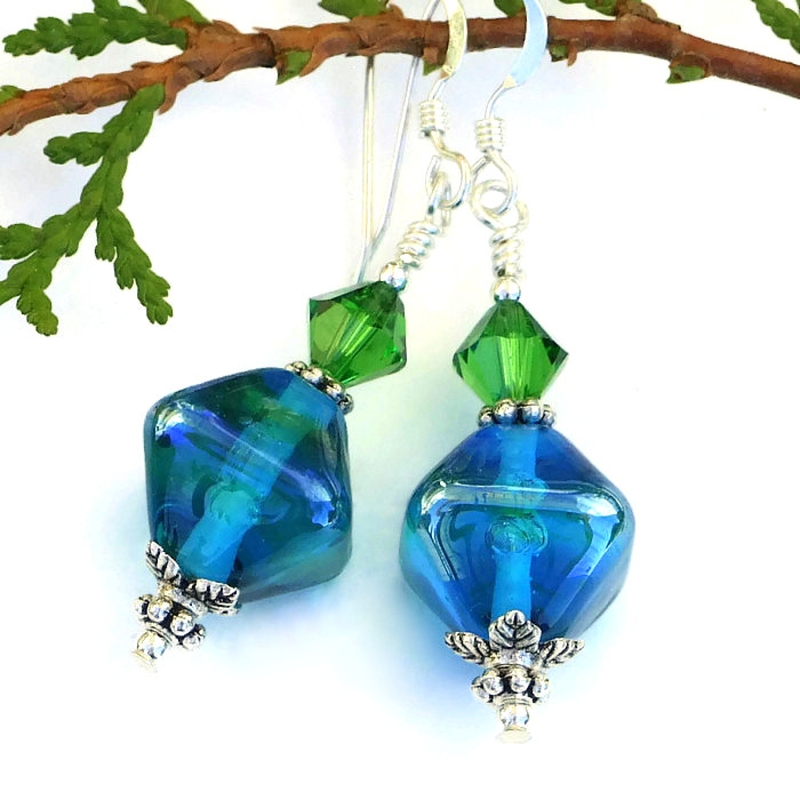 Carefully designed and handmade by Catherine of Shadow Dog Designs, the ENCHANTED AQUA handmade earrings are a perfect gift for the woman who adores one of a kind jewelry. 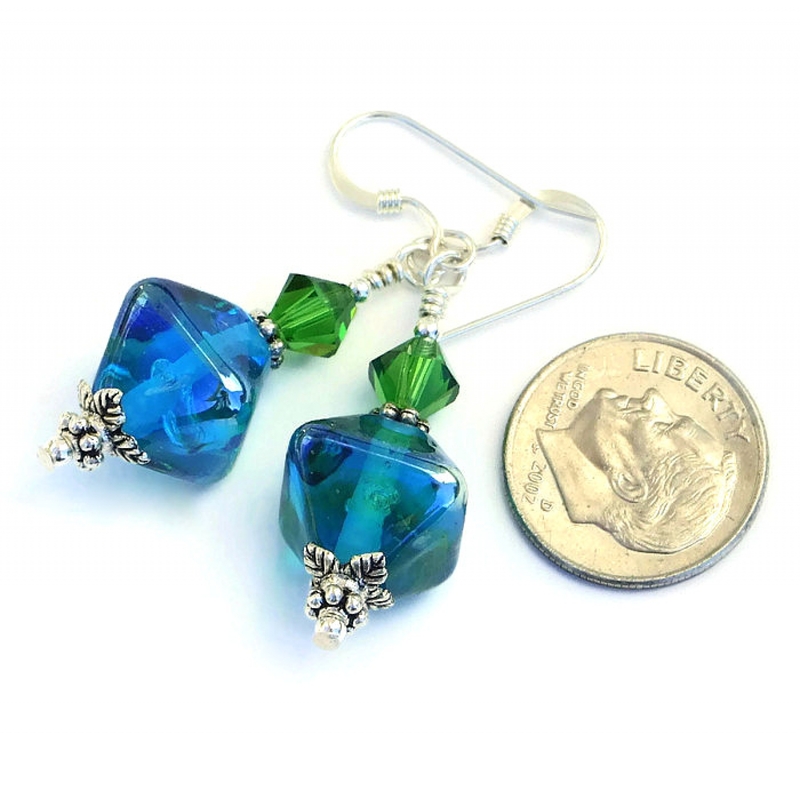 For a better understanding of the relative size of the ENCHANTED AQUA handmade lampwork and silver earrings, please be sure to check out photo #5 for a size comparison with a dime. Although man made, glass and crystal are said to carry the energies of transformation, rebirth and communication. Pewter is believed to be very grounding, bringing the wearer back to reality. Silver is a metal of love and healing; it is a mirror to the soul, helping us to see ourselves as others see us. 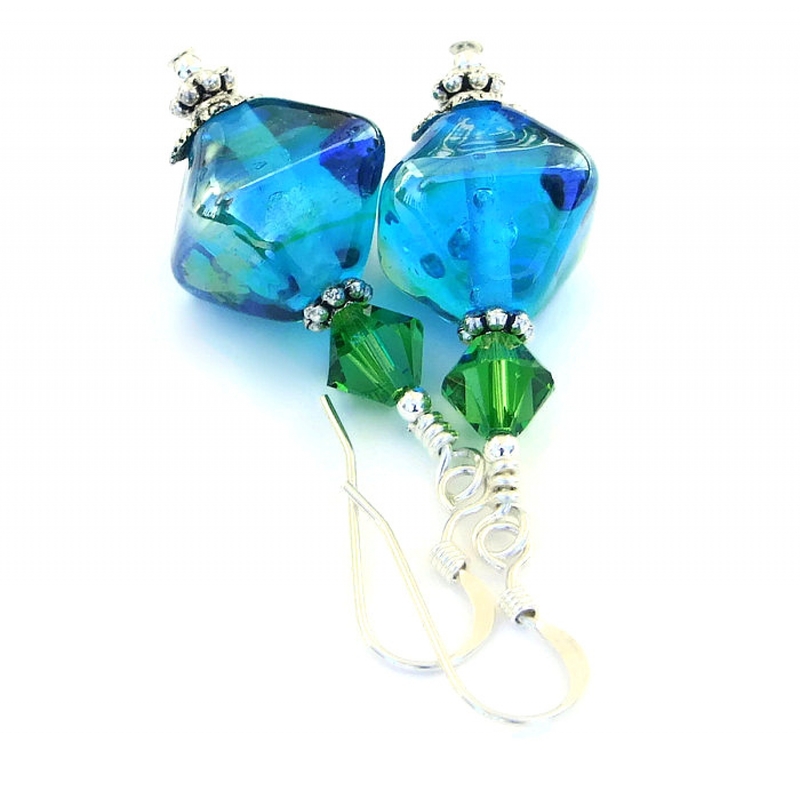 The ENCHANTED AQUA artisan earrings were carefully designed and handmade in a dog friendly, smoke free studio. They will be carefully packed in an organza jewelry bag with tissue, perfect for gift giving to a loved one . . . or to yourself!